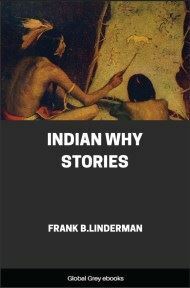 A collection of Native American stories. 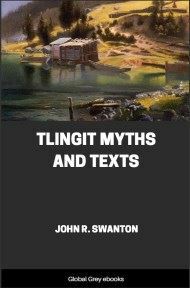 Chapters include: Why The Chipmunk's Back Is Striped; How The Ducks Got Their Fine Feathers; Why The Kingfisher Always Wears A War-Bonnet; Why The Curlew S Bill Is Long And Crooked; Old-Man Remarks The World; Why Blackfeet Never Kill Mice; How The Otter Skin Became Great "Medicine"; Old-Man Steals The Sun's Leggings; Old-Man And His Conscience; Old-Man's Treachery; Why The Night-Hawk's Wings Are Beautiful; Why The Mountain-Lion Is Long And Lean; The Fire-Leggings; The Moon And The Great Snake; Why The Deer Has No Gall; Why Indians Whip The Buffalo-Berries From The Bushes; Old-Man And The Fox; Why The Birch-Tree Wears The Slashes In Its Bark; Mistakes Of Old-Man; How The Man Found His Mate; Dreams; and, Retrospection. WHAT a splendid lodge it was, and how grand War Eagle looked leaning against his back-rest in the firelight! From the tripod that supported the back-rest were suspended his weapons and his medicine-bundle, each showing the wonderful skill of the maker. The quiver that held the arrows was combined with a case for the bow, and colored quills of the porcupine had been deftly used to make it a thing of beauty. All about the lodge hung the strangely painted linings, and the firelight added richness to both color and design. War Eagle's hair was white, for he had known many snows; but his eyes were keen and bright as a boy's, as he gazed in pride at his grandchildren across the lodge-fire. He was wise, and had been in many battles, for his was a warlike tribe. He knew all about the world and the people in it. He was deeply religious, and every Indian child loved him for his goodness and brave deeds. About the fire were Little Buffalo Calf, a boy of eleven years; Eyes-in-the-Water, his sister, a girl of nine; Fine Bow, a cousin of these, aged ten, and Bluebird, his sister, who was but eight years old. Not a sound did the children make while the old warrior filled his great pipe, and only the snapping of the lodge-fire broke the stillness. Solemnly War Eagle lit the tobacco that had been mixed with the dried inner bark of the red willow, and for several minutes smoked in silence, while the children's eyes grew large with expectancy. Finally he spoke: "Napa, Old-man, is very old indeed. He made this world, and all that is on it. He came out of the south, and travelled toward the north, making the birds and animals as he passed. He made the perfumes for the winds to carry about, and he even made the war-paint for the people to use. He was a busy worker, but a great liar and thief, as I shall show you after I have told you more about him. It was Old-man who taught the beaver all his cunning. It was Old-man who told the bear to go to sleep when the snow grew deep in winter, and it was he who made the curlew's bill so long and crooked, although it was not that way at first. Old-man used to live on this world with the animals and birds. There was no other man or woman then, and he was chief over all the animal-people and the bird-people. He could speak the language of the robin, knew the words of the bear, and understood the sign-talk of the beaver, too. He lived with the wolves, for they are the great hunters. Even to-day we make the same sign for a smart man as we make for the wolf; so you see he taught them much while he lived with them. Old-man made a great many mistakes in making things, as I shall show you after a while; yet he worked until he had everything good. But he often made great mischief and taught many wicked things. These I shall tell you about some day. Everybody was afraid of Old-man and his tricks and lies -- even the animal-people, before he made men and women. He used to visit the lodges of our people and make trouble long ago, but he got so wicked that Manitou grew angry at him, and one day in the month of roses, he built a lodge for Old-man and told him that he must stay in it forever. Of course he had to do that, and nobody knows where the lodge was built, nor in what country, but that is why we never see him as our grandfathers did,long, long ago. "What I shall tell you now happened when the world was young. It was a fine summer day, and Old-man was travelling in the forest. He was going north and straight as an arrow -- looking at nothing, hearing nothing. No one knows what he was after, to this day. The birds and forest-people spoke politely to him as he passed but he answered none of them. The Pine-squirrel, who is always trying to find out other people's business, asked him where he was going, but Old-man wouldn't tell him. The woodpecker hammered on a dead tree to make him look that way, but he wouldn't. The Elk-people and the Deer-people saw him pass, and all said that he must be up to some mischief or he would stop and talk a while. The pine-trees murmured, and the bushes whispered their greeting, but he kept his eyes straight ahead and went on travelling. "'That is strange,' said Old-man; 'how can one Person kill so many men? Who is this Person, tell me his name!' but the man didn't answer -- he was dead. When Old-man saw that life had left the wounded man, he drank from the spring, and went on toward the north, but before long he heard a noise as of men fighting, and he stopped to look and listen. Finally he saw the bushes bend and sway near a creek that flowed through the forest. He crawled toward the spot, and peering through the brush saw a great Person near a pile of dead men, with his back against a pine-tree. The Person was full of arrows, and he was pulling them from his ugly body. Calmly the Person broke the shafts of the arrows, tossed them aside, and stopped the blood flow with a brush of his hairy hand. His head was large and fierce-looking, and his eyes were small and wicked. His great body was larger than that of a buffalo-bull and covered with scars of many battles.